This information is from our first ebook, Blood Glucose Levels and Diabetes Control. It describes what happens when the body doesn’t produce enough insulin. Normally, the body’s fine-tuning keeps blood glucose levels between about 60 and 100 mg/dL (milligrams per deciliter), except following a meal or after exercise. 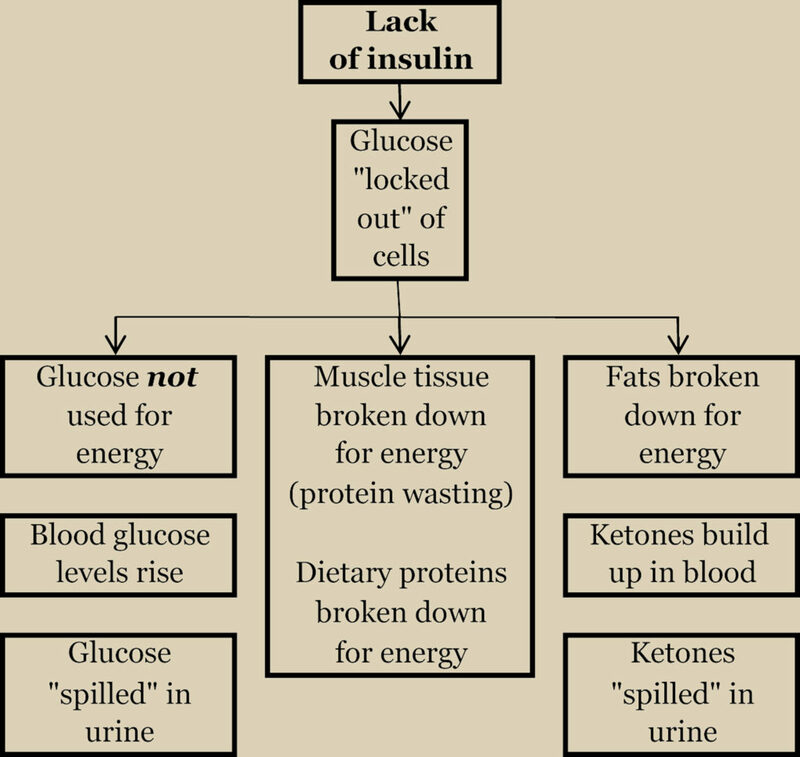 But if the body doesn’t produce enough insulin, glucose is “locked out” of the cells. When this happens, glucose levels build up in the blood. Then the body can’t use or store food for energy in the normal way. Instead, the body obtains the energy it needs by breaking down dietary protein and stored fat and fatty acids. The kidneys “spill” some excess glucose from the blood into the urine. Normally, fluid-filled structures in the kidneys, called tubules, remove glucose from the urine. The tubules then recycle the glucose back into the blood, where the body can use it. Thus, the urine normally contains at most a trace of glucose. But when the amount of blood glucose rises above a certain level, the kidneys are unable to recycle some of the glucose. So they begin excreting—spilling—some glucose into the urine. The level at which this happens is called the renal threshold. It averages about 180 mg/dL, but varies widely. Proteins are broken down, supplying energy. Without insulin, the body can no longer use proteins in the normal way, to build and repair tissue. Instead, the body breaks down dietary proteins and muscle tissue for energy. The breakdown of muscle tissue is called protein wasting. It can cause weight loss and extreme weakness, and can lower the body’s resistance to infection. Protein wasting can also curtail normal growth in children. Fats and fatty acids are broken down, supplying energy. The fats and fatty acids stored in the liver and other tissues are broken down for energy. This abnormal fat metabolism speeds the process called atherosclerosis (hardening and narrowing of the arteries). It also causes waste products called ketones to form—a condition called ketosis. Ketone levels in the blood and urine can reach dangerous levels—ketoacidosis. Nausea, vomiting, and coma can result. Rare in people with type 2, ketoacidosis usually happens in type 1 only when diabetes is especially difficult to control. In ketoacidosis, a characteristic odor forms on the breath. The odor comes from a byproduct, acetone. It resembles the aroma of nail polish remover. 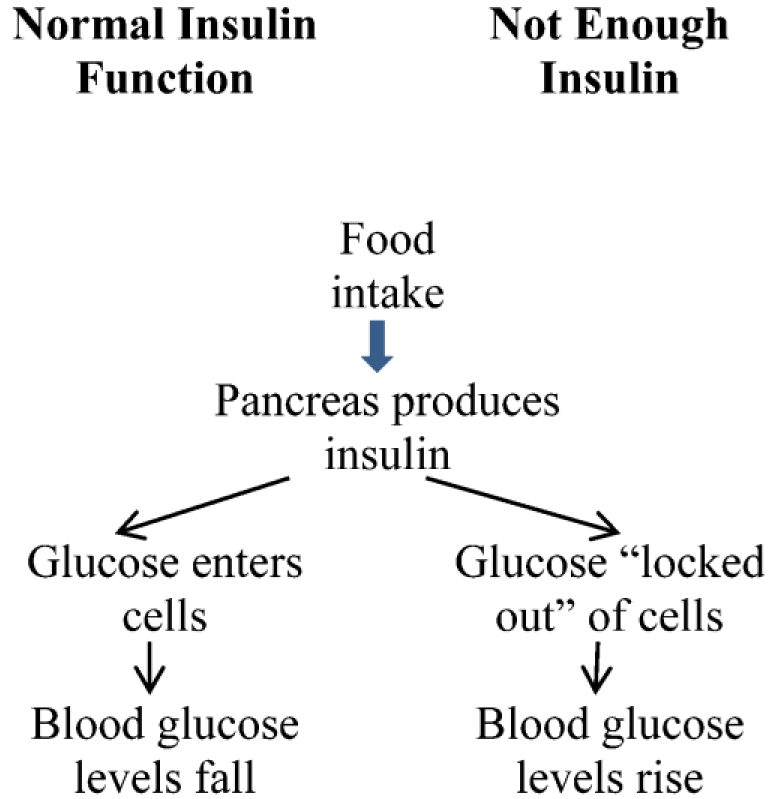 Urine test strips can easily detect ketones in urine. The strips change color, indicating the level of ketones present. Doctors instruct some patients to have these test strips on hand to check ketone levels when conditions warrant. Some blood glucose meters detect ketones in the blood.